HALAWA — After turning over the ball on its first series, No. 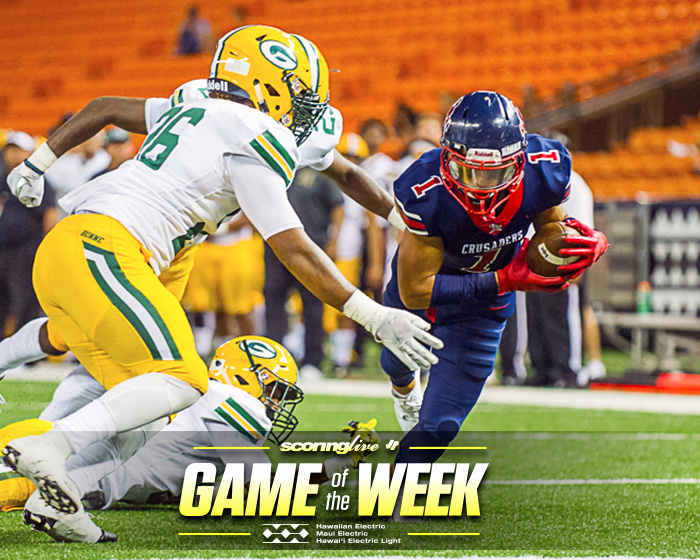 1 Saint Louis scored on its next five possessions en route to a 47-7 win against Narbonne (Harbor City, California) Friday night at HawaiianTel Federal Credit Union Field at Aloha Stadium. The non-league contest, also tabbed as the ScoringLive/Hawaiian Electric Game of the Week, pitted defending state champions, yet it was unlike last year's 56-50 thriller won by the Crusaders. Twice, the game went into running clock mode after Saint Louis (2-0) took a 40-0 lead after scoring on its first drive to start the second half. "It's just another game, but games like this will just prepare us for the postseason. It was good to get another look besides (facing) a Hawaii team," Crusaders senior defensive lineman Gino Quinones said. Saint Louis entered the game ranked No. 12 nationally in the MaxPreps Xcellent 25, while the Gauchos (0-1) were No. 24. Saint Louis is also ranked No. 14 in USA Today's Super 25. "I think this was a good look," Saint Louis quarterback Jayden de Laura said. "These guys (the Gauchos) are a whole (different) speed." de Laura seemed up to speed after a first quarter interception by Paul Edwards that the Gauchos failed to recycle into points. de Laura was 9 of 13 for 150 passing yards and three touchdowns, all in the first half. "I just had to shake that off and come back the next drive," de Laura said of the interception. "I know what I did wrong; I missed the read." Also seeing action at QB in the second half were sophomore Connor Apo, freshman Alexander Bianco and senior Chandan Sappal. Defensively, the Crusaders had six sacks and three interceptions. Narbonne sophomore Jaylen Henderson was 9 off 22 for 116 passing yards and tossed all three interceptions. He was sacked five times. The Gauchos were limited to 162 yards in total offense with 70 coming on a completion from Henderson to Eren East that set up their only score of the game to stop the running clock momentarily. It was reset again when the Crusaders scored on Alema Scanlan's 5-yard TD run. Toward the end of the first half and a commanding 40-0 lead, the Crusaders did not bother to rush Narbonne's punter nor try to return the kick. Besides turnovers and sacks, the Gauchos were hampered by 17 penalties totaling 149 yards. They generated just five first downs. Saint Louis had 347 yards in total offense and made 23 first downs. They were penalized six times for 60 yards. The Gauchos used a no-huddle offense, but were slowed down at the outset because of knee-pad issues. Their only score of the game came on a fake field goal where holder Steve Jenkins scored on a 10-yard run. After the pick, de Laura threw TD passes of 22, 11 and 10 yards to Chance Beyer. Robbie Paikai and Dayton Sam each had first-half TD runs. Scanlan had Saint Louis two TD runs (1 and 5 yards) in the second half.